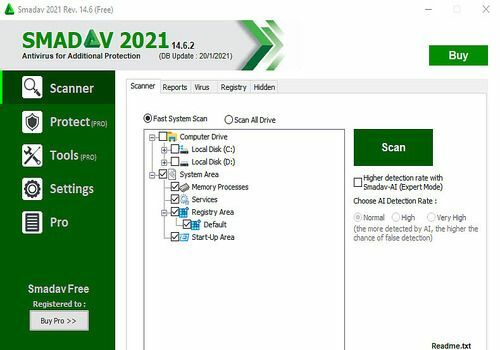 SmadAv is a free antivirus software that allows you to be protected against the various threats that are present on the web. It can be used either as a main antivirus program or as a complement to another program. Very easy to use and install, it offers you all the most useful features: fast or complete scanning, regular database updates, quarantine of infected files. SmadAv also has the merit of being a very lightweight software and therefore does not slow down your computer. It is able to repair your registry if it is infected and runs quietly in the background of your computer. Smadav 2019 has been updated and includes new features. Completely free of charge, it just requires the installation of another antivirus to be fully functional. The Emsisoft Emergency Kit contains a collection of programs that can be used without installation to scan and clean malware-infected computers.